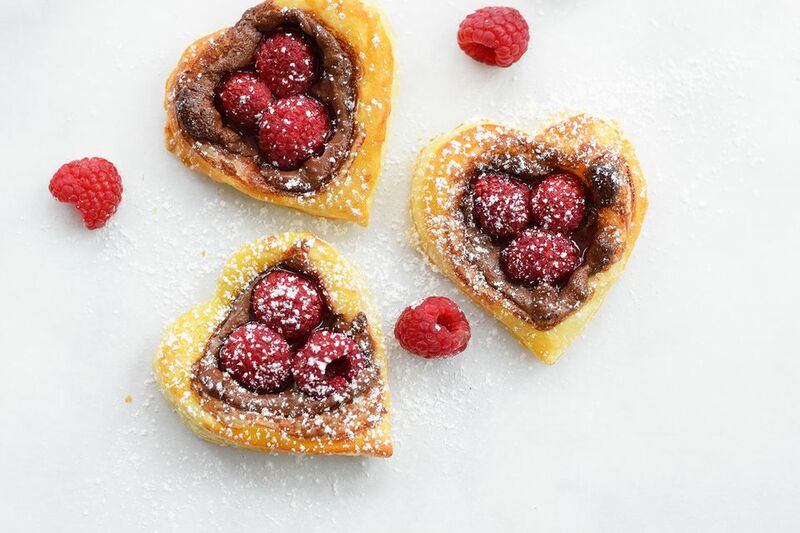 Raspberry Nutella puff pastry hearts are an adorable and simple Valentine's breakfast treat. We are big believers in celebrating love on Valentine's Day, and feel there's no better way to start the day than with a heart themed breakfast. These sweet little hearts are loaded with everyone's favorite chocolate spread, Nutella! A few raspberries give the pastry a nice tart bite. Plus, they also look super pretty on a smear of Nutella. We figure that since there's fruit involved in this recipe, it should be guilt-free, because fruit makes this everything healthy, right? Between the taste and texture of puff pastry, in conjunction with it being super easy to use when you use a store-bought, frozen one, this recipe is just racking up the brownie points. While it does take a bit of time for the puff pastry to thaw -- depending on how warm your house is, it could take anywhere from 20 minutes to an hour -- we still think that this is a choice option for showing your hunny you care. Thaw the sheet of puff pastry on the counter until it is easy to unfold and is ready to be rolled out. This could take 20 minutes to an hour depending on the warmth of your house. Once the dough has thawed, preheat the oven to 400 F.
Roll the dough into a large rectangular sheet. Place the hearts on a sheet of parchment paper on a baking sheet. Make sure the edges of the hearts aren't touching. Prick the center of each heart with a fork multiple times, leaving about 1/8-inch for the border that is not pricked. This step is very important, without it the center will puff up too much and the Nutella will spill over! Place about 1 teaspoon of Nutella over each pricked center. Top with 2 to 3 raspberries. Repeat with remaining hearts. Beat the egg so that it is completely combined. Use a pastry brush to brush the egg wash on the exposed edges of the hearts. Repeat with the remaining hearts. Bake for about 10 to 15 minutes or until the edges are golden brown. Allow them to cool slightly and then dust them with powdered sugar. If you don't have time to wait for it to thaw, you can replace the puff pastry with crescent roll dough. It won't have the same flavor as the puff pastry -- obviously -- however it will cut down your prep, leaving you more time to enjoy your sweetheart's company.